This year the theme of the World AIDS day was Getting to Zero and we at Buds believe this can happen when the already affected people are also encouraged and motivated to live a positive life. 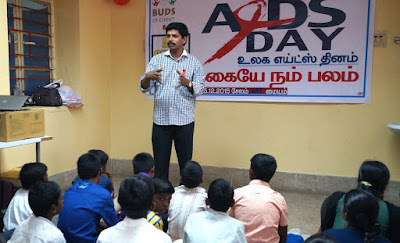 Buds of Christ commemorated the 2015 world AIDS day in encouraging young adolescents in salem and smaller children in Tiruchengode along with care takers to be confident and live a life with hope and dignity. The uniqueness of this year programme was the young people living with HIV and affected by HIV of Buds of Christ (Buds Leaders) had planned and executed the event. The programme was conducted on 5th of Dec at Salem and 12th of Dec 2015 at Tiruchengode. In the salem group the 20 participants were mostly young adolescents in the age group of 14 and above and at Tiruchengode, the 15 smaller children were in the age group of 5 and 12 years old. Both the programmes were organised at government Hospital ART centres. The programme included a choreo, skit, drawing competition, testimonial and a motivational song. The key highlight was the testimonial sharing by the care-taker (woman living with HIV) and her child. Though it brought in a emotional outburst among the participants, the end-result was that it encouraged both the children and the care takers to look at their own lives more positively. "HIV has affected everybody in my family, my husband, my two girls and me. Yet, my husband does not bother and has left us alone to live with another family in another village. After my HIV status, in addition to being a mother, I have been the bread-winner and I had to go for coolie work in the feild to support my daughters. In addition I also constructed our house with the help of my daughters and I even had to become a construction worker. Today, when shalini's mother was sharing, it helped me to realise the strength I have had within me in passing through these challenges. If her mother can bring up her three daughters, I too can bring up my daughters in the best way I can”. - Proud HIV positive mother of her daughter winning the first place in the drawing competition.